In almost any area of life, it’s hard to make progress without first forming an idea of what you’re aiming for. In mobile business terms, this means examining some of the most successful apps as case studies, highlighting examples of best practice and areas in need of improvement. To put this into practice, I downloaded five of the most popular UK news apps to see what lessons we can learn from those who seem to be getting it right. Taking into account the star ratings users had given them as well as the total number of app store reviews, I picked user-favourites Sky News, The Guardian, Flipboard, Bloomberg and Readly. Some of the best sources of inspiration are the apps that are already achieving success in the sector: by looking at the elements the users of these apps are enthusiastic about, they offer ideas for how to approach moments in the app experience that can be difficult. News apps are a particularly interesting example: in theory (let’s ignore fake news and bias for a moment here, if we can), they should all be delivering essentially the same content. Whilst the differences in app popularity are partly resulting from the quality of the writing and the viewpoint of the reporting, the experiences they deliver through onboarding, interactions, and alternative ways of engaging with content can all contribute to an app’s popularity too. The use patterns of news apps also make this especially challenging: unlike a travel app that you might turn to a few times a year, most users check news apps several times each day, meaning that any snags in the user experience are magnified. Becoming a popular app is not an easy feat, but despite the odds, the news apps I’ve trialled here all have thousands of users giving them stellar reviews. These reviews can benefit apps through boosting acquisition numbers, and indicate high customer satisfaction and engagement rates. Essentially, however, what all those thousands of glowing reviews translate to is that these apps seem to be doing a lot of things right - clearly, there are some lessons to be learned here. When 25% of users will only open an app once, having so many users stick with these apps long enough to positively review them is a sign that they’ve mastered the first time user experience. As we’ve all experienced first-hand, that original app experience can be make or break. Recently, I’ve downloaded dozens of apps in the name of research, and I’ve deleted the majority of them almost immediately, because they simply haven’t made my first experience good enough to secure a second attempt. A major factor in this can be how much instruction, if any, they give to new users. By pointing out features and how to use them, you not only start to build a user-app relationship, but also ensure that users don’t get faced with an unfamiliar screen that makes them give up within seconds. 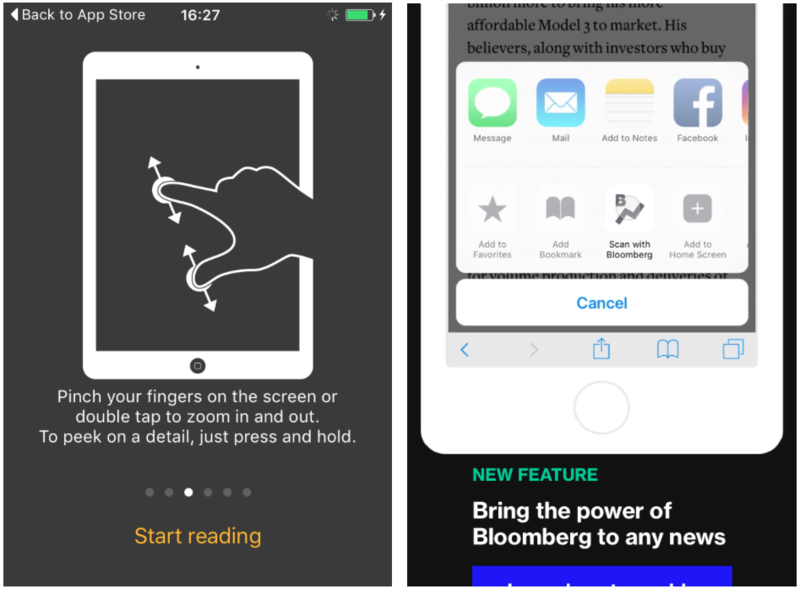 The Bloomberg and Readly apps both have elements that need some explaining; to make the experience more efficient and engaging, they’ve opted to show rather than tell. Bloomberg used an animation of a phone screen to show exactly how to access a new feature, whilst Readly used a carousel of simple diagrams to demonstrate and describe the touch screen commands. The use of intrusive or untargeted ads and subscription promotions is amongst the most commonly complained about topics in app store reviews, and yet these are obviously necessary to monetizing an app and making it profitable. These five news apps are somehow managing to strike the balance between great customer experience and effective monetization. There are a few different approaches being used here: Sky, for example, features small, unobtrusive banners along the bottom of the screen. 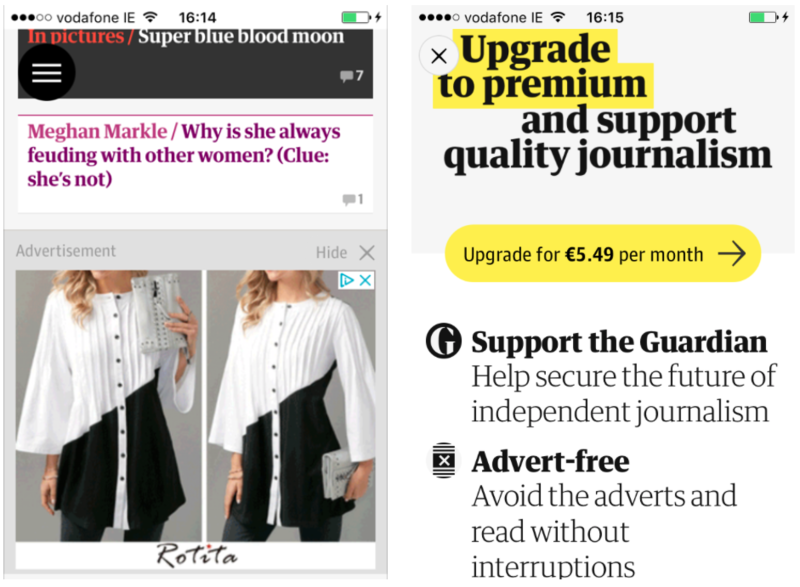 The Guardian app includes embedded ads similar to those used on their website, but the clever part of these is the small ‘hide’ button in the corner. This acts as a convenient conversion point between free accounts with ad-generated income, and a paid subscription. If you’re a regular free user and the ads have begun to bother you, you might click that ‘hide’ option, which then triggers a screen that suggests upgrading to the paid app version to remove the ads completely. Those users who click to hide the ads are likely to be interested in this feature of the premium app, so this effectively targets the subscription suggestion to the people who are likely to appreciate its benefits. This prevents the upgrade message from imposing too overtly on the reading experience, and probably increases the conversion rate. Optimize this kind of message in your own app by A/B testing the screens users are shown with variations on text and image: comparing the data on these will help maximise conversion rates. Notifications are a necessity for news apps - breaking news isn’t breaking news if you only see it when you remember to check the next evening. 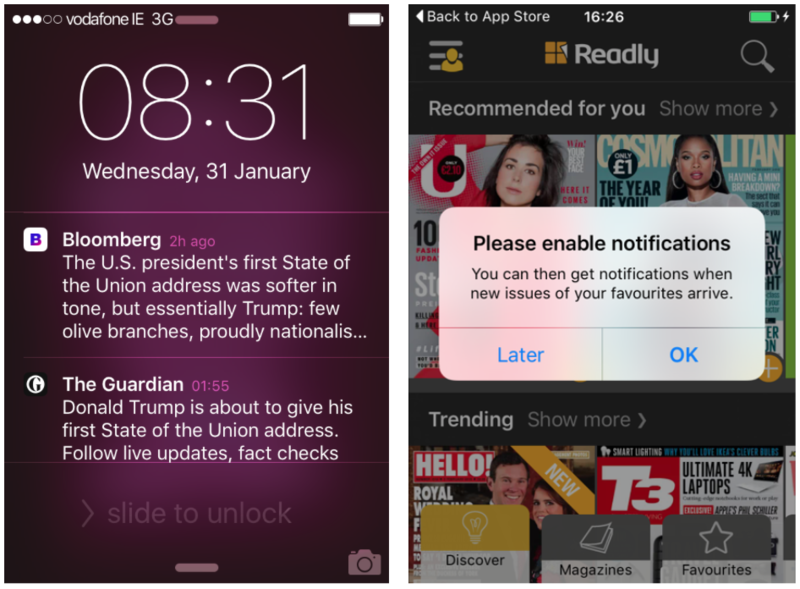 With many users having more than one app on their phone that reports news, there’s competition for your notification to be not only the first but also the most attention-grabbing one on people’s screens. If there was no option for updates, you’d be likely to have many users leaving, but the same would also be true if the notifications are irrelevant or badly timed. I accepted the notification permission request on all five apps, and what I recieved was a very mixed bag. As an example, I woke up to three notifications about the State of the Union speech, with varying degrees of success. Sky notified me at a reasonable hour, promising the kind of summary that would be useful to start my day with. Bloomberg notified me bright and early, but with a lengthy piece of text that didn’t fit onto my screen. The Guardian pinged a push notification onto my phone at 1.55 AM, waking me up to tell me that the speech was about to begin. The key lesson from this is to make sure your notifications are targeted to suit the users who'll be receiving them. Ensure the messaging displays perfectly on any device they choose to view it on, and time your push notifications to only alert users during the times they’re usually most active in the app. It really is impossible to keep every user happy all the time. App store popularity is in part due to being smart about how you request, respond to and learn from reviews. Whilst very few people read through reviews in as much detail as I did for this article, many new users might take a look at the number of stars, the number of reviews, and whether any complaints are being dealt with. The first two of these can be boosted by targeting your review requests to users who have just completed an action or had a positive experience, and asking if they’re satisfied before requesting a review. The latter is a matter of responding to users - several of the apps I looked at had a good track record of replying to comments, and many reviewers gratefully acknowledged when the app had reacted to their criticisms. Reduce the numbers of negative reviews by using customer data to inform your marketing strategy, A/B testing new types of interaction, and making it simple for users to converse with you inside and outside the app. So, what what have we learned? There are valuable takeaways to be gained from looking at popular apps, although not all of them are through examples of best practice. These apps are a useful source of ideas for different ways to go about tricky areas of the user experience, from easing onboarding to dealing with complaints. If you have the time, it’s worth doing a similar experiment with popular apps from the sector you work in - the best way to improve user engagement is to experience what being a user feels like, and the results might just surprise you.